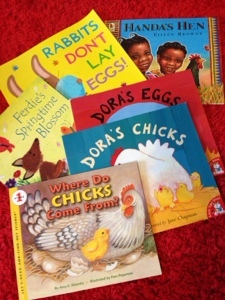 Following on from my spring and easter discovery basket here is the book round up as promised. Handa is in many popular children's book and this story helps teach counting and Handa looks after her hens. Rabbit is eager to join the farm but he doesn't have a job to like all the other animals. Until the yard discovery Rabbit is fantastic at finding veggies from the farmers fields. Handa is in many popular children's book and this story helps teach counting and Handa looks after her hens. Ferdie is the mischievous fox cub who turned up in our Autumn book round up. This time is is again confused by the changes he is seeing as the seasons change. Beautiful illustrations and a lovely story of friendship and fun. Dora is stuck in that awkward phase of pregnancy when all her friends cute newborns have arrived and hers is pretty dull! Luckily she soon learns that her babies are really very lovely. Dora has a slightly lackidazical approach to parenthood and manages to lose some of her brood! They have gone in search of food but as newborn chicks are a bit confused as to which would be the best food for them. 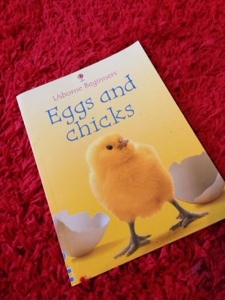 A really good factual account from fertilization to hatching. It also includes images of an egg incubating so is really great to use along side any eggs you may be keeping and hoping for hatchlings from. Better for older children due to vocabulary. I've seen a few books in this theme 'play book' and they are usually a great variety of textures, flaps and themed pages on colours, shapes and playing! This is no exception and L enjoys the larger than average pages. The classic which is now 45 years old. He is looking well for it. This large size is great for sharing and the board pages are pretty L proof. Once again the mouse can't find his/her specific animal, toy or imaginary creature. Silly mouse. Great images. Lovely textures. Baby friendly to the max. Baby animals are the theme of this lift the flap classic. L loves to use her pointy finger to turn pages and try and find the baby animals. Great for spring or before a visit to the farm. Another great non-fiction book this time slightly simpler than the previous book. A great size and small nuggets of easily digestible information. A great introduction to the theme and to non fiction books. I'm not familiar with most of these so thank you for the recommendations. 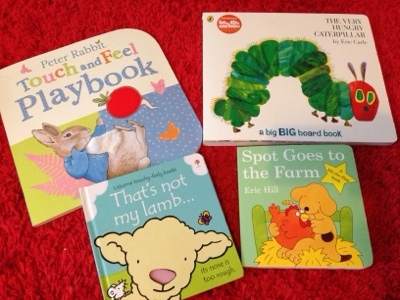 We have the hungry caterpillar, peter rabbit play book and that's not my lamb. Rod Campbell's Oh dear! which is a farm yard lift the flap is my current favorite spring read.